Species description: This shark was the largest in history reaching up to 70 “ long with up to 7 inch teeth which means every inch of a tooth was 10 ft of length. It lived about 5 million years ago . It ranged over large areas of the ocean. IT looked similar to a great white shark but larger-much larger. 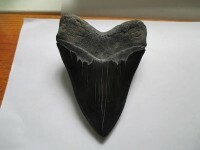 Item description: 1-10 9.3 4 ¾”, 4 ¼” , 3 ¾” , 3 ¼” Large SHARK MEGALADON TEETH . Megalodon Teeth while common –ones in this great condition and shape. The top size ever found is 7 inches and these are big so you can get 4 at one time. No one sells the 7” ones as they are worth over $50,000 and only 6 exist. Only a handful of 6 inchers even exist These only 1 has small amount of repair as others totally natural . The lengths as shark lengths are based on 10 ft per inch means these sharks go from 40 ft -50 ft Sharks Imagine that . These are very detailed and an excellent ultra large examples of the species. IT has no nicks , was totally natural . They have beautiful colors . Keep in mind the side most people think is the front is actually the back. The front of these teeth is and beveled side both are very very good with great serrations on all and enamel .These teeth are worth over $200 each average but for you half price . You can’t get these sizes wholesale for this even. Item description: (1-10) *9 * Gigantic 5.80” Megalodon Shark Tooth from a 60 ft Monster. 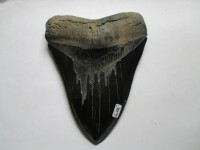 The largest tooth found is around 7.25” and they go for as high as $7,000 for ones just an inch longer than this. 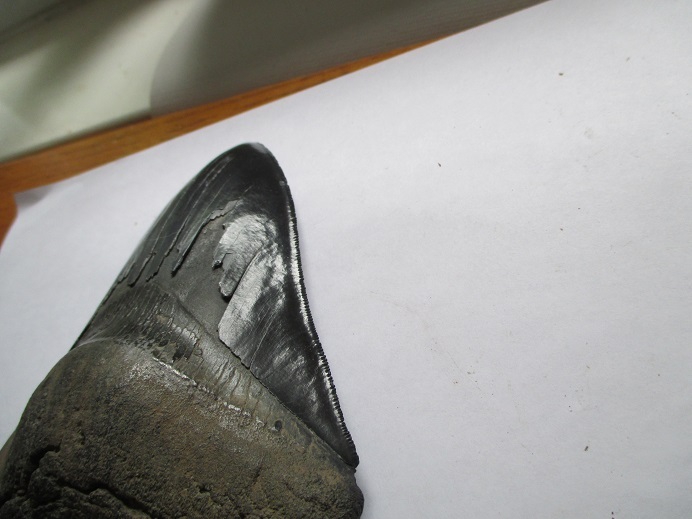 This is an amazing tooth, as it has great color, and many nice serrations with fine detail on sides. 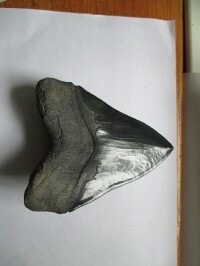 It has some wear on the tooth on both sides-back of the tooth has the most and could have been natural wear. While not perfect, all items to measure it are great except some wear which is the least important thing. This tooth is for someone who wants a very good huge tooth. 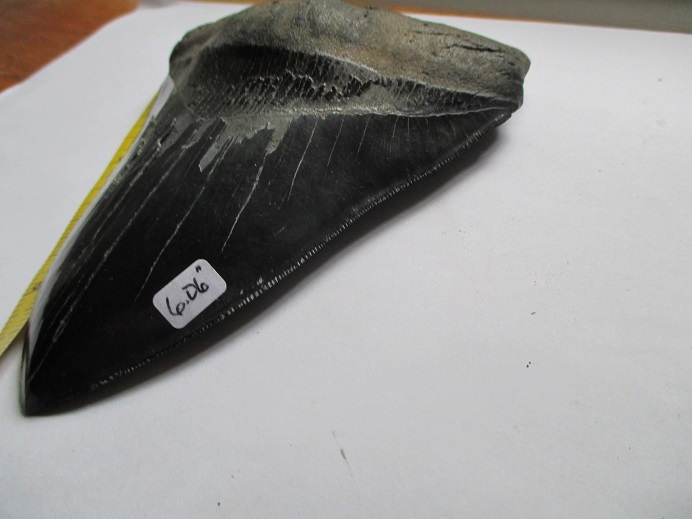 If this was perfect, it would sell for $2500-3000 so it is a super tooth for someone on a budget. It is very detailed and an excellent ultra large example of the species. It was sold to me as a museum grade so I have a lot in this tooth. Its color and serrations are x fine, and a super tooth . It had some repair on cracks, but no resto at all It’s for the person who wants a big one but doesn’t want to spend for perfection, considering $4000 plus for a tooth like this. I’ve sold many of these and this is very fine!! Monster 6.06” 100% Natural Black-Gray Megalodon Shark Tooth!! Species description: This shark was the largest in history reaching up to 70’ long with up to 7 inch teeth which means every inch of a tooth was 10 ft of length. It lived about 5 million years ago. It ranged over large areas of the ocean. It looked similar to a great white shark but larger - MUCH larger. Item description: (1-10) *10 Gigantic 6.06” Megalodon Shark Tooth from a 60 ft Monster. 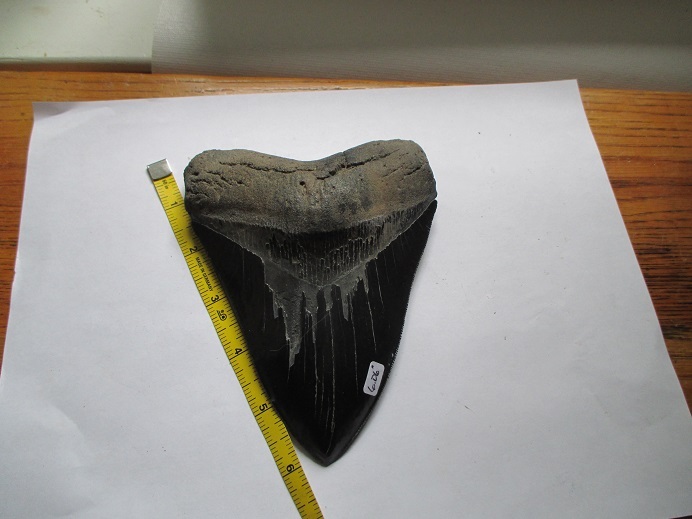 The largest tooth found is around 7.25” and they go for as high as $7,000 for ones just an inch longer than this. This is an amazing tooth, as it has great color, and super serrations with no nicks on sides. Its only negative is it has some wear on the tooth on both sides-back of the tooth has the most and could have been natural wear. While not perfect, all items to measure it are great except some wear which is the least important thing. This tooth is for someone who wants a very good huge tooth. If this was perfect, it would sell for $3500-4000 so it is a super tooth for someone on a budget. It is very detailed and an excellent ultra large example of the species. It was sold to me as a museum grade so I have a lot in this tooth. Its color and serrations are amazing and the best I ever had. No repair, no restore on this tooth for sure. Both sides are fine with some wear at the edges only but edges are uniform. I decided to sell close to my cost just to get a new customer. It’s for the person who wants a big one but doesn’t want to spend for perfection, considering $4000 plus for a tooth like this. I’ve sold many of these and this is very fine! !